King Shaka International Airport is situated on the outskirts of Durban easily accessible by the National N2. Drive time from the Durban center to the airport is approximately 20 minutes. All domestic routes are accessible from Durban as well as most International Flights. King Shaka International Airport, conjointly referred to as La Mercy Airport, is the major airport in the city of Durban, South Africa. Located at La Mercy, approximately thirty five kilometres north of the city centre . King Shaka International Airport opened its doors to the general public on 1 May 2010, a month before the beginning of the 2010 FIFA World Cup which was based in South Africa. King Shaka International Airport replaced the existing Durban International Airport that was decommissioned upon the opening of the new airport that cost R6.8 billion. King Shaka International was designed to grow in International services and remains a key airport to Domestic services throughout South Africa. It serves the “Golden Triangle” between Cape Town International, OR Tambo International in Johannesburg, and King Shaka itself. 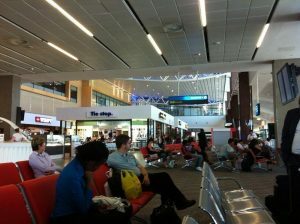 King Shaka International Airport is said to be ranked the ninth busiest airport in Africa..